Sunset in Paris from the Parc de Belleville, with moon and Eiffel Tower. Photo by Jeff Mitchell, April 2011. I lived in Paris for the 2010-2011 academic year, in the 11ème, about a half block from the Bataclan concert hall where, the day before yesterday, so many people were shot and killed, after others were shot and killed on streets and in restaurants nearby, after explosions at the Stade de France, as well as in Lebanon and Baghdad, where still more people were killed. And I’m not qualified to diagnose the world’s ills, I don’t understand it and I won’t pretend I have any idea. But Paris is on my mind—our tiny apartment and the old neighborhood, the market where little old French ladies elbowed my large, polite husband out of their way, the dirty streets, the protests that filled Boulevard Voltaire every couple weeks. Americans have a lot of fantasies about Paris. Beautiful, romantic, sophisticated, liberated or libertine, home of the finest food, art, and fashion, home of philosophers and poets and painters… or, for some people, the center of effète snobbery and elitist crap. I’m not sure why, but Paris exists for many of us as an ideal, mythical place, and that fantasy place isn’t entirely fictional, either. Paris is all those things—it’s got the art, the food, the poets and philosophers and snobs. So I think Paris holds a place in the American imagination that other cities do not. Attacks on Paris are attacks on our dreams. But Paris is also a city made of people, millions of people who live and work there and have all their lives, for whom the city is not a fantasy but a real place, a tricky and twisty place that must be managed and manipulated, that can be enormously frustrating. It’s filthy, expensive, polluted and overpopulated; you have to wait in lines, watch for pickpockets, watch your step. If the weather’s bad and you’re trapped in the cold, damp 15 square meters that constitute your temporary home, it can start to drive you a little crazy. And Paris has been a battlefield many times throughout its history, during the Wars of Religion, the many Revolutions, the Commune. It’s a city that suffers, and bleeds, and endures. People are lost, and that is tragic and cruel; but Paris isn’t going anywhere. But if you’re an American reading this and mourning the dream, here’s an idea. Next time the weather’s good enough, grab yourself a friend–or a lover, or a book, either way; a blanket or three (it’s November, after all), a bottle of wine, some bread and nice cheese. Go find a sunny spot to lie in. Snack and talk and get a little tipsy, check out the world around you, the people and the sky. That was always the beautiful life in Paris, for me. 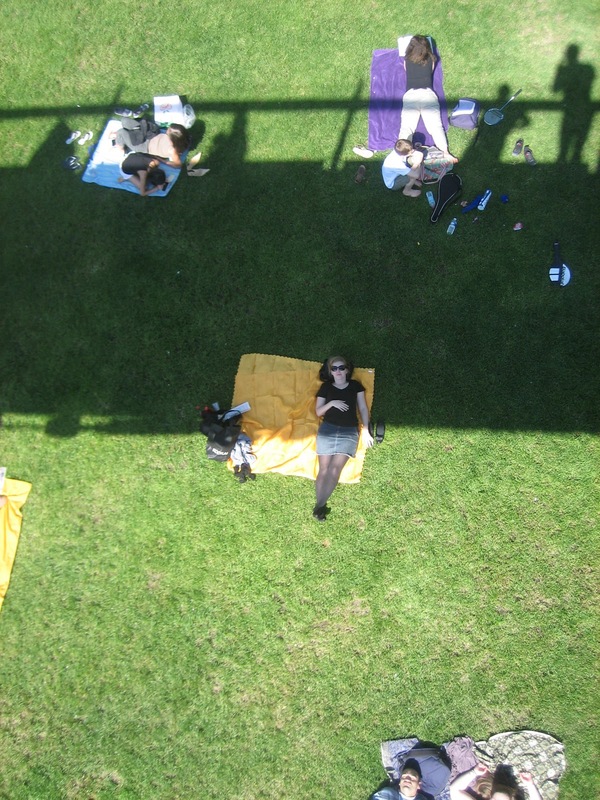 Napping on our yellow piquenique blanket in the Jardin de Reuilly. Photo by Jeff Mitchell, whose shadow is visible on the upper right. April, 2011.